Port placement for laparoscopic surgery in patients who have had prior surgeries can be complicated by the presence of anterior abdominal wall adhesions. To avoid inadvertent bowel injury, it is important to choose the location of the first laparoscopic port carefully. An important principal for laparoscopic port placement in the reoperative abdomen includes placement of ports away from prior operative sites. 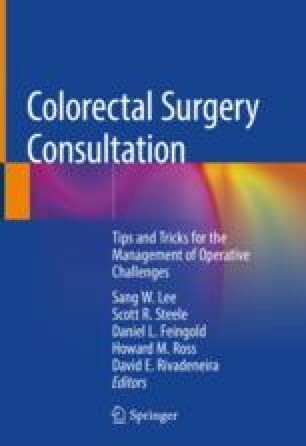 There is no statistical difference in rates of bowel injury between access to the abdomen achieved by open or closed laparoscopic entry, and method of entry should be determined by individual surgeon comfort and familiarity with entry method. Ahmad G, Gent D, Henderson D, O’Flynn H, Phillips K, Watson A. Laparoscopic entry techniques. Cochrane Database Syst Rev. 2015;(8):CD006583. https://doi.org/10.1002/14651858.CD006583.pub4.